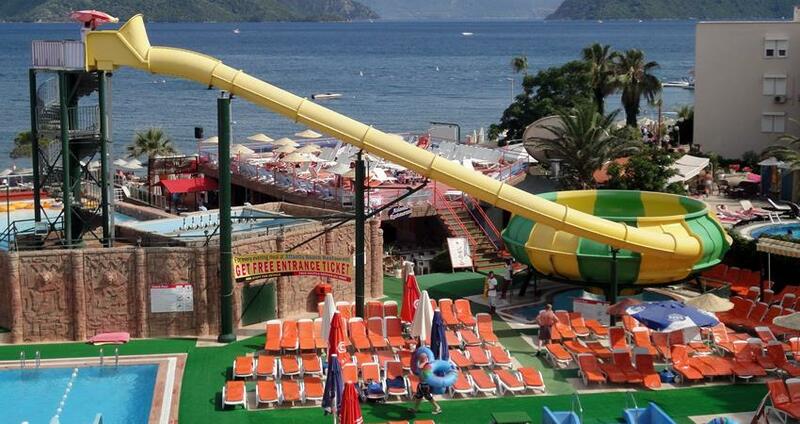 You can see the available dates for Atlantis Waterpark Marmaris. Please use the booking widget to make your reservation. 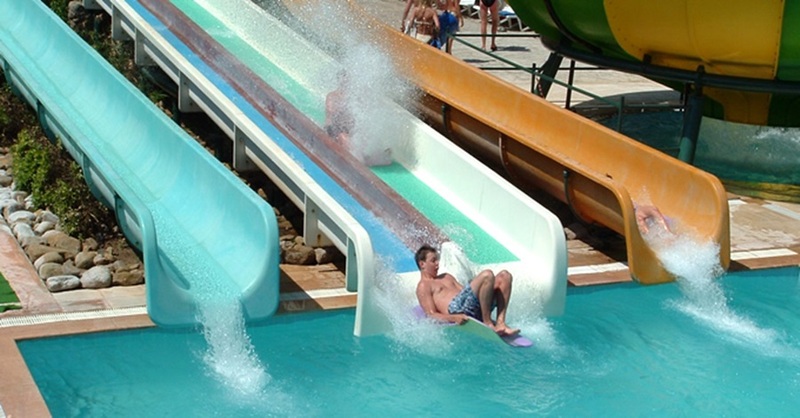 Atlantis Waterpark Marmaris has a full range of attractions for fun-lovers of all age-groups. We have 5 different pickup times to take you there by our free hotel transfer service at your convenient time. The numerous slides, Wave Pool, Mini Golf, Kids’ Pool, Food and Beverage outlets, a private beach on the seafront will certainly keep you engaged all day long! 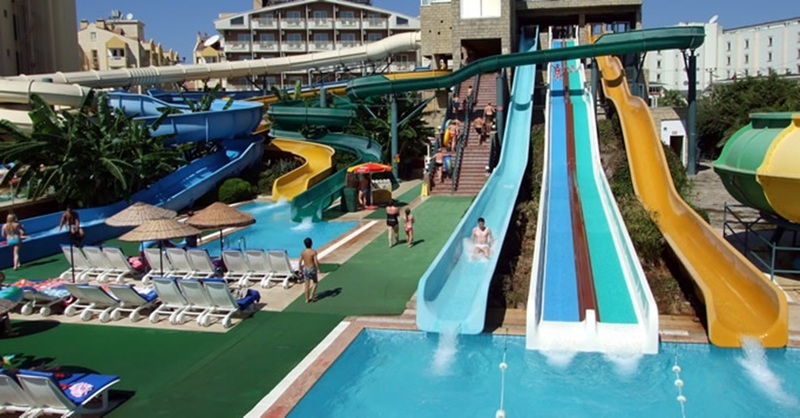 Atlantis Waterpark is located on the heart of the Marmaris Longbeach. Featuring a wide range of play rides and a myriad of facilities, the waterpark offers a complete entertainment package for your entire family. Atlantis Waterpark has its own Private Beach. This is a perfect place to lean back lazily out in the sun. You can swim in the crystal clear blue waters and recline over the sun beds under the cool umbrellas. The sun beds and the umbrellas at the private beach are provided for visitors at no extra cost. The full service snack bar at the park serves a wide range of eateries and drinks including chilled beer. 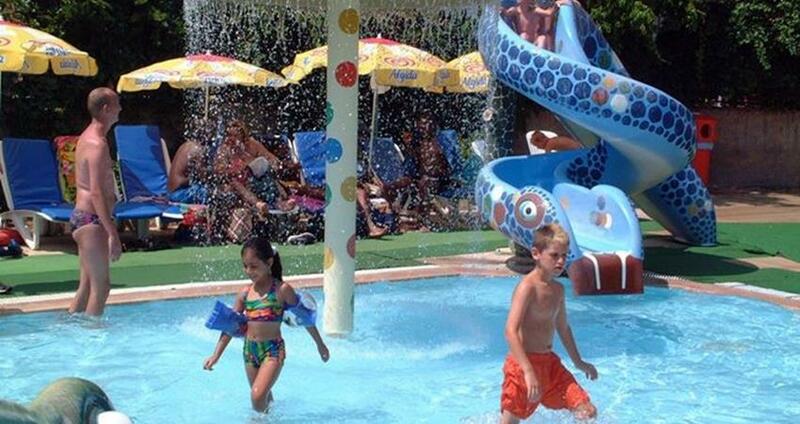 Our waterpark is kids friendly and the children enjoy playing in the park all day long. The ‘KidsLand’ in the park is children’s favorite spot that gives them a fairy tale experience. This area has many slides with splashing waters and animal mini-rides. The Octopus’ Arms, the Mushroom Shower, Sliding into a Snake and playing around with the friendly Rabbit provide your kids with fun-time to remember for long. 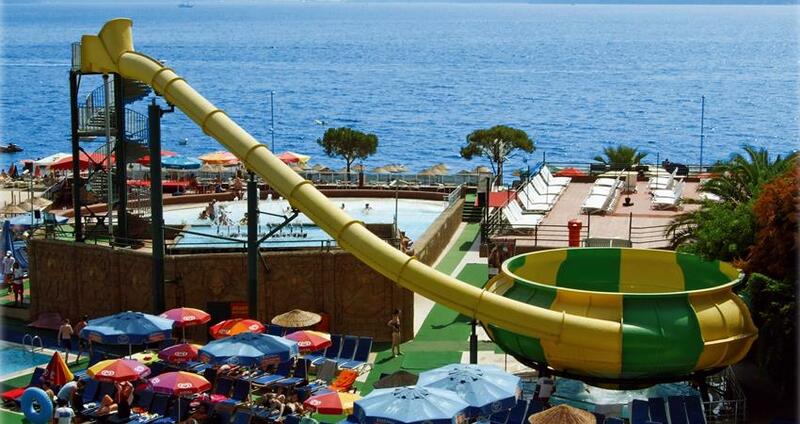 The Atlantis Waterpark is well-equipped with all the facilities to make your holiday the most enjoyable one. Facilities like lockers, changing rooms, safe boxes, showers and toilets, sun beds and umbrellas at the private bar and all tubes to play at the slides and Wave Pool are provided for free! Other facilities include First Aid Unit, Food and Beverage Outlets and Seating Areas around the Poolside. At the Atlantis Waterpark, waters at all the rides and pools are checked on daily basis to ensure high standards of cleanliness and hygienic conditions. The food on offer at all the outlets in the park comply with standards set by the International Safety Inspection Services (ISIS). Full Insurance, Hotel Transfer, Entrance Fee to Atlantis Waterpark, Safe Boxes, Lockers, Showers, Sunbeds & Umbrellas. All Drink and Food Options, Mini Golf, Personal Expenditures. Any Food or drinks from outside will not be allowed into Atlantis Waterpark. Be aware of the slippery and wet surfaces in the waterpark. All jewellery, watches, eyeglasses, sunglasses must be removed before sliding. Atlantis Waterpark in Marmaris located right at the hearth of Marmaris next to the beach. We were a bit afraid to book anything with this agency as no reviews here and the prices are so good. Our first try was Atlantis waterpark and yes, we are very happy with everything! The agency responded by email within an hour. Then we have got vouchers from someone representing the agency right on time at our hotel. We spent an adventurous day at Atlantis, the park is great and definitely worth the money. We also ate a lunch there - it was acceptable and affordable. We ate at second floor in soft playground area - there is a nice view and refreshing breeze. Thank you, marmaristravel.net! Can i bring any food or drinks from out side ? Because of the policy of Atlantis Water Park, guests are not allowed to bring any food or drinks from outside. 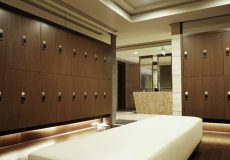 Do you have changing rooms and lockers ? Do you have first aid facilities on site ? When is Atlantis Water Park open ? Please check the calendar or the booking widget to see the open time and dates. Do you have plenty of sun beds and shaded areas for the guests ? 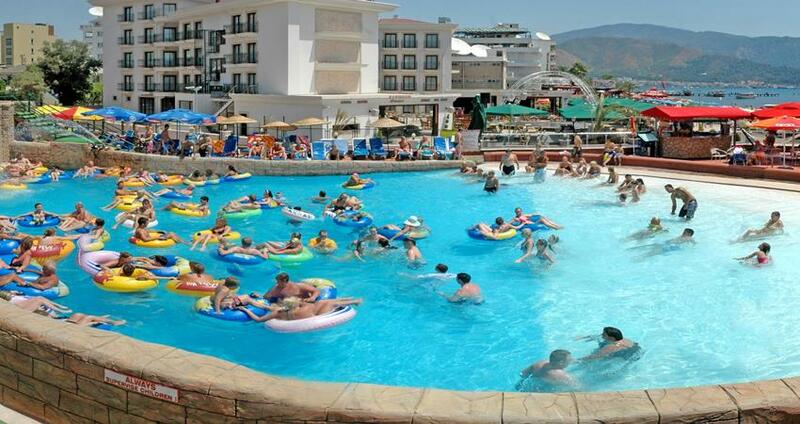 Yes, we have hundreds of sun beds and umbrellas provided free of charge both within the water park. We have a family area around the Kids Pool with many sun beds where the parents can supervise their children while sunbathing. How long can we stay in the park ? You can stay at the park during the opening hours as long as you wish. 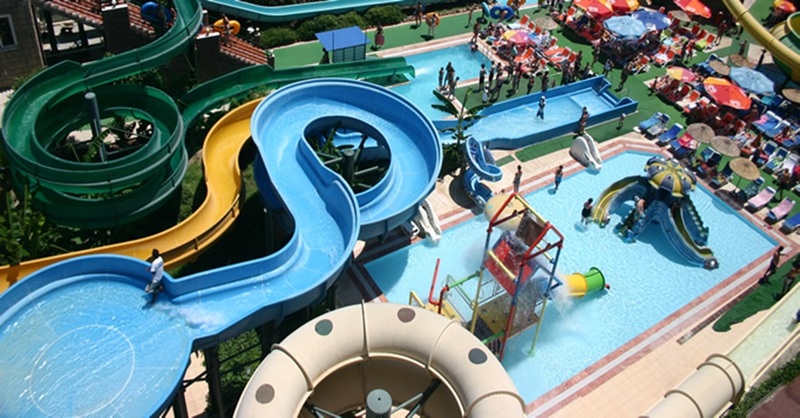 Atlantis Waterpark Marmaris is featuring full-day fun for your entire family. With 8 different slides and a myriad of other facilities, the park provides a complete entertainment package for your family. The park is open between 10:00 am and 5:00 pm and operates 5 sessions a day. 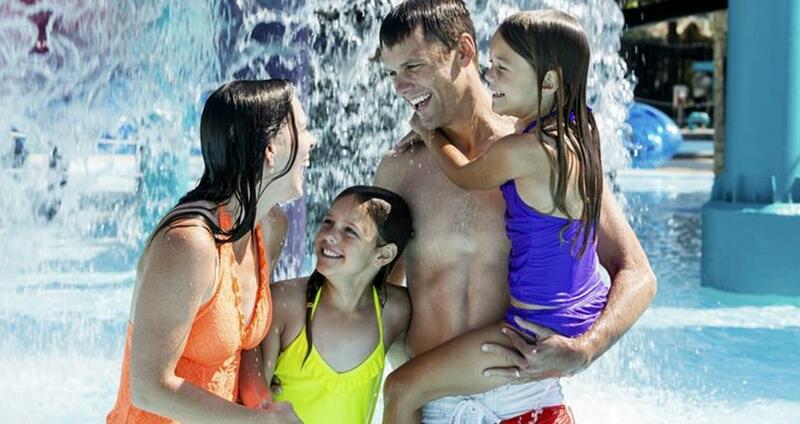 We arrange to pick you up from your place of stay at your convenient time and take you into the waterpark. Atlantis Marmaris Waterpark is equipped with all the facilities to ensure that your family has the most enjoyable day out. The park offers a wide range of value added facilities and services for free. These include Lockers, Safe Boxes, Changing Rooms, Showers and Toilets, Car Park, Private Beach with Sun Beds & Umbrellas. 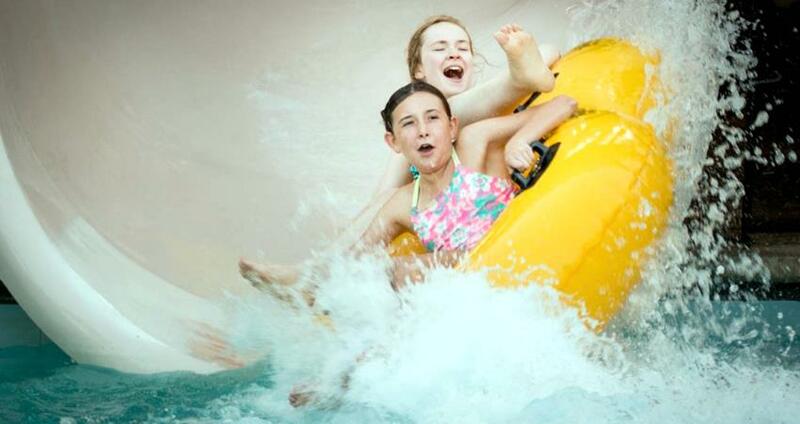 All tubes to play at the slides and wave pool are provided at no extra cost. First Aid: A fully equipped first aid room located within the Waterpark has qualified and well-trained staff. Food & Beverage Outlets: You can choose your favorites from a great range of food and beverages available at the Aqua-Marmaris Restaurant & Bar, Treasure Restaurant, Wave Pool Bar, Atlantis Beach Restaurant & Bar located within the park. Seating Areas: Select your best among the large number of seating areas located around the pool side to enjoy the stunning seaside scenery and savor the refreshments served at the park. Bottle and Baby Food Warming Facilities: Bottle and baby food warming facilities are offered at all of the catering outlets in the park. Changing Facilities for Babies: These facilities are available in ladies toilets, ladies and family changing rooms. The Wave Pool is one of the most unique and popular water sporting units at the park. It starts at 12:00 noon and runs for 15 minutes each hour in every session i.e. at 13:00, 14:00, 15:00 and 16:00. 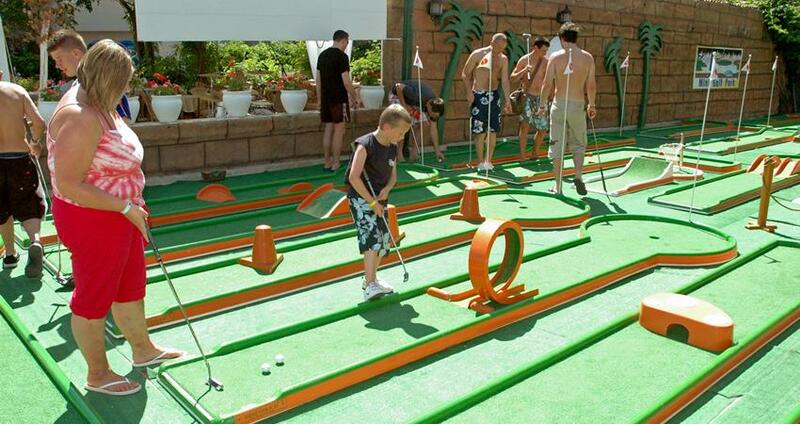 Mini Golf located on the beach is one of the most interesting games one must try. The 18-hole miniature golf course is playable by even the novices of the golf players. Fee for this exciting game is not included in the tour price and it is charged extra. As you enter the park, you are provided an arm band. With this arm band you are free to get in and out of the park all day long. As the waterpark is located on the beach front you can make use of the facilities like sun beds and umbrellas at no extra cost. Atlantis Water Park always maintains high standards of cleanliness and hygiene. Water at all the places in the park is checked and the cleanliness is ensured on daily basis. 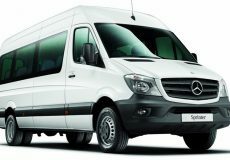 The return transfer to your place of stay begins from 15:00 pm onwards and the services are repeated after every half an hour interval. Shuttle buses plying from the park take you back to your hotel at no extra cost. Some of the important facts and useful information about " Atlantis Waterpark "